Roger Dowsett also known as the Digger Man recently purchased a new Kanga mini 6 series. Infact, he drove it off the stand at Elmore Field Days! The Digger man operates within a 150km radius of his base in Katamatite. He told Kanga, he rides the highs and lows of a new business. Roger hasn’t always been in landscaping and maintenance. He took a step of faith 3 years ago when he was made redundant from his position as Regional Operations Manager at the Salvation Army. Despite having little experience in this line of work Roger is happy to be out from behind the desk and getting stuck into it. He set up his business doing what he enjoys – being outdoors, landscaping, ground maintenance and being an all round handy man. 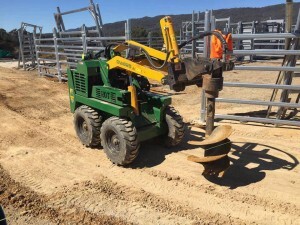 To get help with his day to day activities Roger uses a Kanga mini loader. The entire range of Kanga mini loaders are designed to make light work of the hard work and suitable for a multitude of applications. 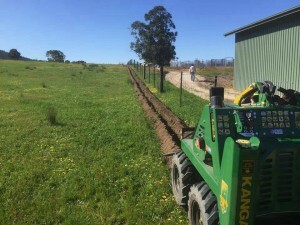 Roger is now working on projects he would not have tried before, explaining to us that he always looks forward to work and “having a crack” on his new machine. Completing a variety of works from general bucket loading and lifting, gravelling driveways, trenching and installing many post holes for new fences, Roger really digs the versatility of the machine and extremely pleased with the service he has received throughout the purchased process. The machine is so versatile, I can get into places that a larger skid steer can’t which gives us a huge advantage in homes and gardens. It is easy to operate and not tiresome on the body as it’s a smooth machine and I truly can’t speak highly enough of it.